Sequel to Meet the Rhythm Section, one of Pepper’s most east coast records, due no doubt to the presence of its top east coast rhythm section. To my mind, Pepper lacks the fire in his belly of the best New York saxophonists, he somehow seems to hold back, but its a pleasing outing, and the combination of east and west coast sensibilities makes for good listening.. Deep Groove on Contemporary Vogue labels – UK first release from the Fifties. These are usually first class pressings that rarely disappoint. Rich bass, punchy mid-range, sizzling top end. Original machine stamp matrix code, with the 1B” suffix. – Decca convention “B” identifying the engineer. Original release came a little expensive due to being a “buy it now or make an offer”. These are rarely as good a price as by auction, and I usually ignore them for the same reason, but on this occasion I was feeling depressed after losing a series of bids to “high rollers”. These were auctions where you think you are making a realistic bid at £150 and they close at £350. Whereas my better half would console herself by buying three pairs of shoes, I treated myself instead to a record with no auction hassle ( I already have one pair of shoes to go with my one pair of feet, but I can always make room for another record) . The Contemporary catalogue has long been bulk reissued by the digital-to-vinyl transfer pressing plants, immediately identifiable by a large handwritten Contemporary catalogue number Cxxxx in place of proper machine stamp matrix code in the run-out, and usually on ultra-thin “wobble-board” vinyl. The covers however look deceptively period thick card, with no indication of being a reissue. Always check the vinyl visually before reaching for a credit card, and on ebay, ask a specific question what is written in the run-out, as sellers often don’t know or prefer not to know! Nice condition, original pressing, one happy new owner, slightly out of pocket. 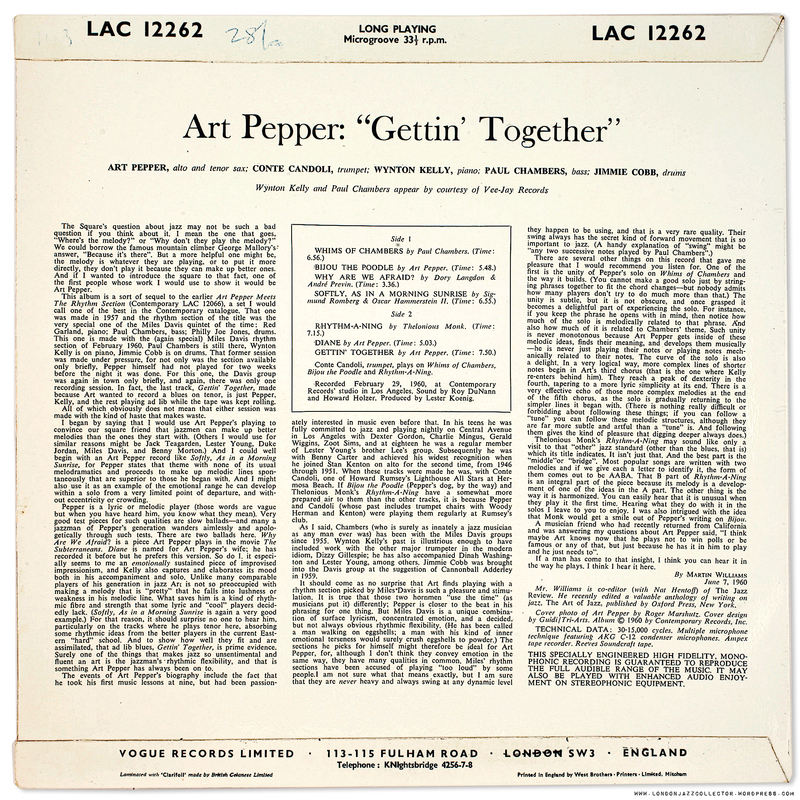 This entry was posted in Art Pepper, Contemporary, West Coast and tagged Art Pepper, Conte Candoli, Contemporary, Jimmie Cobb, Paul Chambers, west coast, Wynton Kelly by LondonJazzCollector. Bookmark the permalink. This is a very interesting blog. I enjoyed the comments. 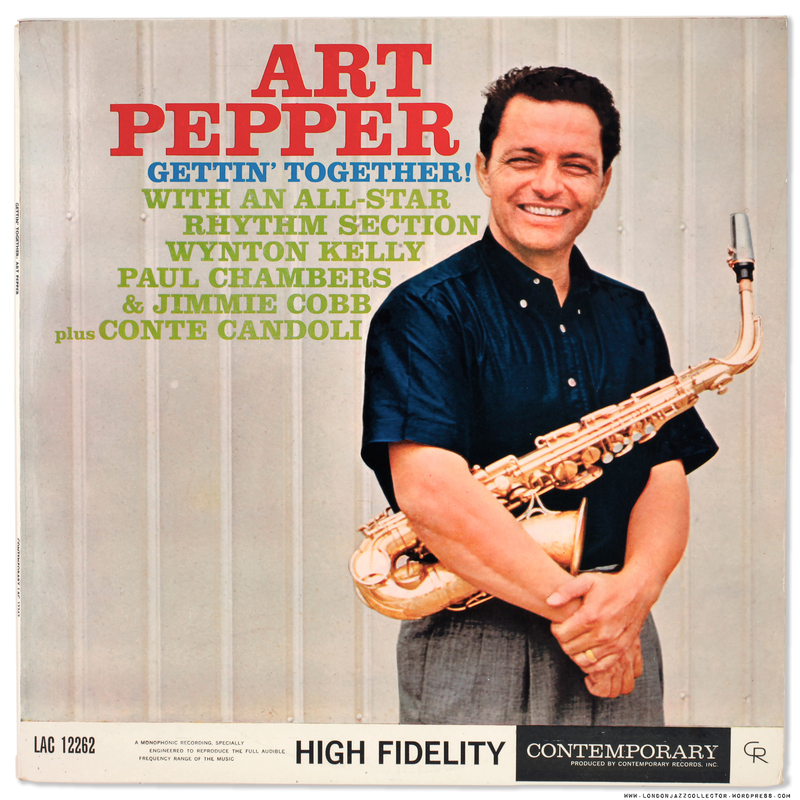 Art Pepper is one my favorites. I first became aware of his playing from the 1951 Capitol 78 book album “Shorty Rogers–Modern Sounds.” Later, I bought the 10-inch Capitol LP. Over the years, I bought additional Pepper 78s and LPs. With the exception of “Surf Ride,” I believe I purchased the LPs discussed here as they were issued. “Surf Ride” I acquired much later because I hated the cover. Still do. I attended two nights of his performances at the Vanguard and bought two of the three albums recorded there. as you all know, early 70’s is an exception yet for my tastes, but you must have a listen to Living legend, the come back Contemporary S 7633.
it’s a 1975 recording, published 1976, absolutely cheap. quartet with Hampton Hawes, Charlie Haden and Shelly Manne. I used this vinyl to choose my equipment: listen to Ophelia, side 1 track 1 for one of the best bass sound (upright bass) I ever heard. does anyone have this Pepper? Thank you. You are the first person who has ever been able to explain it to me. Most grateful George. That style of code was typical of Decca. If it is a Decca master and pressing, then 1B at the end of the matrix number would denote where it came in the sequence of matrices (ie this is a first pressing) and the code i.d. of the engineer who did the job. The letter only identifies the engineer – it’s the number before it that tells you you have a first edition. My only Pepper album is ‘No Limit’ from 1977. Maybe a little late for you LJC, but it’s a beauty. 1977 isn’t on my radar – I bought an Art Peppper called “Besame Mucho” Described as “Art Pepper live at his best ever! Pepper started his new life on this tour in Japan; this was his first road band, playing his charts the way he wanted to hear them played” (1978). I’m afraid it was traded back in the next day. However I am always up for persuasion. Wouldn’t be the first time I’ve been wrong.